Alligators communicate with each other in a variety of different ways. Baby gators in distress will â€˜chirpâ€™ to summon their mother, and sometimes even unrelated alligators will also respond to the call. Adults employ a range of vocalizations, hisses, roars, and bellows when confronted with danger or when defending their territory. Gators also have the ability to hear and emit ultra-low frequency vibrations, which are inaudible to the human ear, yet travel for great distances. The force of these ultra-low frequency rumbles literally make water droplets leap off the gatorâ€™s back, an effect known as the â€˜water dance.â€™ The alligator uses these long-range signals to announce its presence to distant gators, advertising its availability to potential mates and warning off potential rivals. Interestingly however, the alligator seems to be easily confused by other sources of ultra-low frequency vibration. 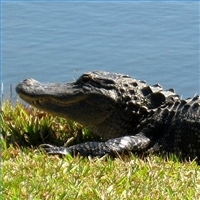 Thunderstorms often trigger the rumbling response in gators, as do large vehicles or other heavy machinery. Hereâ€™s an article about a guy who got some gators horny with a tuba serenade. Obviously, vehicles and tubas have only been a feature of the gatorâ€™s environment for a very short time, evolutionarily speaking. But thunderstorms are another matter. It seems reasonable to assume that gators have been responding to thunderstorms for a very long time. There doesnâ€™t seem to be an evolutionary downside to select against this effect. If anything, the alligators might gain a slight advantage by advertising their own presence more frequently. Presumably the thunderstorms donâ€™t care one way or the other. Nonetheless, the fact remains: alligators reply to thunderstorms as if they are responding to a fellow alligator. In short, alligators have a religion. Alligators have probably been replying to these phantom sky gators for millions of years. It does them no apparent harm, and may do some good. At any rate, no sky gator has yet attempted to invade alligator territory. There are many, many instances of living speciesâ€”both animals and plantsâ€”which gain a direct and obvious evolutionary advantage by masquerading as other species. However, I am unable to recall any other example of a creature consistently mistaking an inanimate natural phenomenon for a member of its own species. Birds and other animals have been known to respond aggressively to their reflections in mirrors, but mirrors are an artificial phenomenon. Birds apparently do not perceive their reflections in water the same way. It seems like any such error in perception ought to have serious negative consequences from a reproductive standpoint, yet the gators seem to be doing fine with it. Is it fair to say that alligators alligatormorphize? Are there other such examples in nature? That's fascinating. The only question I'd have is whether the rumbling is an indication that the alligators are interpreting the thunder noises as one of their own, or are simply responding to an environmental stimulus. I mean, I've had dogs that barked and yipped at thunderstorms, but it's just because they were nervous, not necessarily because they thought the noises were dogs and trying to reply. This is a good point. From what I have read, the consensus seems to be that the rumbling isn't triggered by anxiety or stress in general. Gators will hiss, bellow and charge (or turn around and leave) if confronted by a strange threat, but they do not 'water dance' in such a situation. How utterly cool. It does sound like it's more of a response than a dog barking at a loud noise. IMHO that OP is Front Page material. I second this. I think it's fascinating and very nicely written. It should go on the FP with a link back to this thread for comments. If we're serious abut bolstering our ranks with non-ex-Dopers who just are into cool stuff, we should put cool stuff where they can see it. I find this interesting and wish to subscribe to this belief. Next time there's a thunderstorm I too will stand outside, emitting low, rumbling noises in response to the Great Sky Gator. Presumably the thunderstorms don’t care one way or the other.